Carlos Vives is a Grammy Award winner and seven time Latin Grammy Award winner. He was was born in Santa Marta, Colombia. Later on he and his family moved to Bogotá in search of a better life. In Bogota, he acquired a taste for rock, getting involved in the local music scene, and started playing in bars and cafés around the city. In 1982, Vives began acting in a number of shows and telenovelas including "Pequeños Gigantes" (Little Giants - 1983) and "Tuyo es Mi Corazón" (Yours is My Heart - 1985). He finally found notoriety in 1986 by playing the title role of Gallito Ramírez, which told the story of a Colombian Caribbean coast boxer who falls in love with an uptight girl, who was portrayed by his first wife, Margarita Rosa de Francisco. That same year, he released his first album, Por Fuera y Por Dentro. The album, primarily made of ballads, failed to gain any success. In 1987, he released his second ballad album, No Podrás Escapar de Mí. Though the title track reached #30 on the Billboard Hot Latin Tracks, the album did not sell well. His next album, Al Centro de la Ciudad, would become his last album to feature synthesizer-romantic ballads. Some of the songs got some attention being featured in telenovelas, but the album, just as its predecessors, failed to gain success. In 1989, he was offered an acting job in Puerto Rico, and upon moving, he took a break in his music career. He is remembered for his leading roles in the soaps La Otra and Aventurera. In 1991 he returns to Colombia where he was offered a TV role that would change his life forever. He was cast in the leading role of a fantasy series based in the life of vallenato composer Rafael Escalona . He sang the composer's songs in the series, and that's when he retooled his career towards vallenato music. In 1993, backed by the band "La Provincia", Vives released the album Clásicos de la Provincia in which he started fusing Vallenato with rock, pop and other Caribbean Colombian ethnic rhythms. This style of vallenato was a huge success not only in Colombia but all over Latin countries, and the albums' lead single, La Gota Fría, became a hit all over Latin America. Clásicos de la Provincia, won the Billboard Latin Music Awards Best Album and would become a timeless classic in Colombian and Latin American music, introducing Vallenato to both Colombia and the rest of the world. The follow-up album, La Tierra del Olvido would mark a further step in Vives' desire to fusion rock, funk and pop music with traditional Colombian genres. The album gave Vives classic hits such as the title track, and the up-tempo opening track Pa' Mayte. His subsequent releases, Tengo Fe (1997), El Amor de Mi Tierra (1999), Déjame Entrar (2001) and El Rock de Mi Pueblo (2004), were all commercially successful and were well received by the critics. In 2001 Carlos Vives' album "Déjame Entrar" won him his first Grammy award for Best Traditional Tropical Latin Album. In 2009 he released the album Clásicos de la Provincia II, which was sold exclusively in Colombian supermarket chain "Almacenes Éxito." The album saw Vives' return to covering famous Vallenato songs in his own style. It sold massively and the single Las Mujeres received wide radio airplay in all Colombia. His hits include "Matilde Lina", "La Hamaca Grande", "La gota fría", "Alicia Adorada", "Pa' Mayte", "La Tierra del Olvido", "Tu Amor Eterno", "Fruta Fresca", "Déjame Entrar", "Luna Nueva", "Carito", "Papadio", "Como Tú" and "Décimas Del Parecido" . 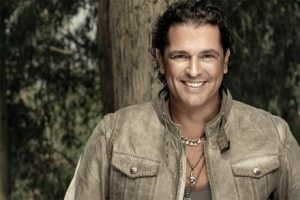 In 2012 Carlos Vives began a new era in television and music. In a world where few idols reinvent themselves, Vives initiated a new era with grace, experience and vision. His new album was released in April 2013 and featured 11 tracks. The first single, "Volvi a Nacer", was released in September 2012 and became a hit. The second single, "Como Le Gusta a Tu Cuerpo" featuring Michel Telo was released in late January 2013. Carlos also appeared as one of the coaches in the Colombian version of The Voice with fellow artists Ricardo Montaner, Fanny Lu, and Andres Cepeda.